MEF 3.0 CE is the third generation of MEF-defined Carrier Ethernet services providing the highest level of performance, assurance, and agility available in the industry. MEF 3.0 CE services are designed to meet the most demanding needs of the digital economy. Breaking free from constraints imposed by static connectivity and time-consuming manual processes, MEF 3.0 CE services provide an on-demand, cloud-centric experience with unprecedented user- and application-directed control over network resources and service capabilities. MEF 3.0 CE extends well beyond today’s widely adopted CE 2.0 services to provide the most advanced standards-based offerings available in the $50+ billion global CE services market. The comprehensive MEF 3.0 CE service portfolio includes a set of subscriber services (E-Line, E-LAN, E-Tree) and a set of operator services (Access E-Line, Access E-LAN, Transit E-Line, and Transit E-LAN) that can be orchestrated over programmable networks using LSO APIs. MEF 3.0 CE services incorporate dozens of published standards from MEF - the world's defining authority in standardized network services. 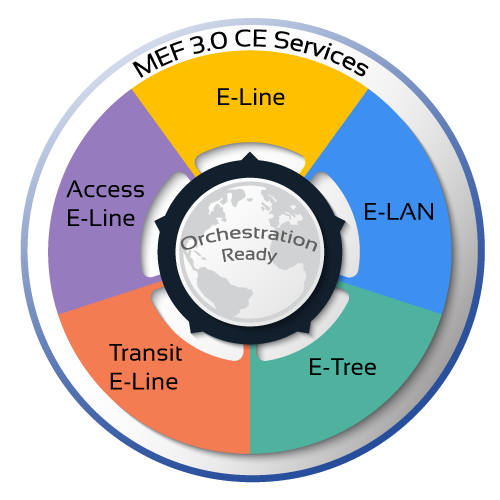 MEF 3.0 CE enhances E-line, E-LAN, and E-Tree services with new and re-defined service attributes included in MEF specifications published during 2013 - 2018. MEF 3.0 CE Access E-Line, Access E-LAN, Transit E-Line, and Transit E-LAN services are based on specifications published during 2016 - 2018. 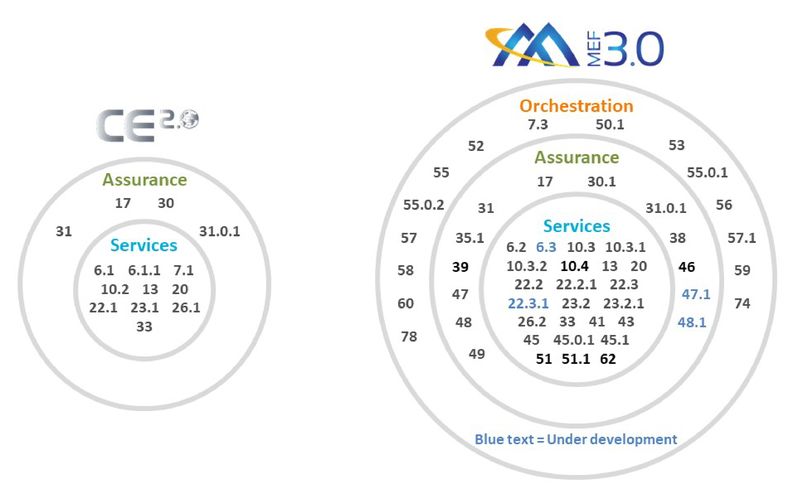 The figure above shows a comprehensive list of MEF 3.0 CE-related specifications sorted into three major categories: enhanced services definitions and attributes, assurance, and orchestration. The MEF 3.0 service and technology certification program is designed to accelerate availability and adoption of MEF 3.0 solutions. MEF 3.0 CE certification is delivered through MEF’s testing partner, Iometrix, on an on-demand cloud-based virtual test platform that empowers companies to certify that their solutions comply with the latest releases MEF 3.0 CE standards. The MEF 3.0 framework provides the ability to align certification with incremental releases of services and LSO APIs. The MEF 3.0 CE Certification Blueprint specifies the service attributes and parameters of MEF CE 3.0 services that are to be verified during certification testing. MEF spearheaded creation of the $80 billion annual global market for Carrier Ethernet services and technology that involves more than 650 service providers and dozens of technology companies worldwide. 105+ service providers in every major geographic region offer MEF CE 2.0 certified services, and multiple service providers already have received the MEF 3.0 CE certifications. 43 CE 2.0 certified technology vendors offer 420+ CE 2.0 certified devices, and multiple vendors aready have received MEF 3.0 CE certifications. More than 6,000 MEF-CECPs are employed by 440 companies in 85 countries.